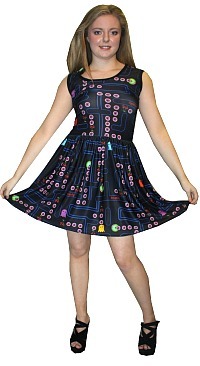 Pac-Man fancy dress is perfect for a retro, 80s or gaming themed party or event, and outfits are available for both men and women. So, let's take a look at the wide range of costumes available. Please note that all quoted prices are subject to change, but hopefully they won't have risen by the time you're reading this post! 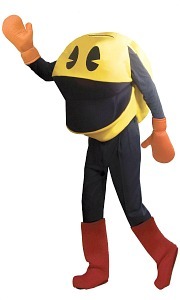 The official Pac-Man costume certainly isn't cheap at £47.99, but if you really want to look the part then you can't go far wrong with this outfit which consists of a yellow jumpsuit, boot covers and gloves. It's perfect for gaming or retro events and this cheerful-looking character is sure to put a smile on people's faces. 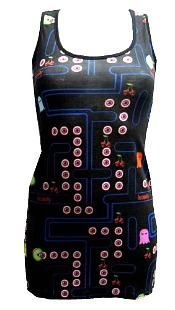 A cheaper alternative (£29.99) to being the actual Pac-man character is to be the whole game board. This authentic-looking costume looks just great and will be a great talking point at any party. Now, here's a great idea! 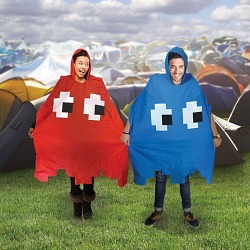 You can instantly become a Pac-Man ghost with one of these ponchos. Priced at just £5.95 with free delivery, they're perfect for any retro gaming or 80s fan, and ideal for wearing at festivals to keep out the rain. As you can see, there are plenty of options available for Pac-Man themed dress-up, and as just about everyone recognises the characters from the game, wearing one of these outfits will create an instant talking point - a great ice-breaker at any party! Also check out the post Best Pac-Man T-Shirts on this blog.